Just like sports card sets highlight one particular season, 2017 Upper Deck Marvel Annual brings that same mindset to entertainment collectors. 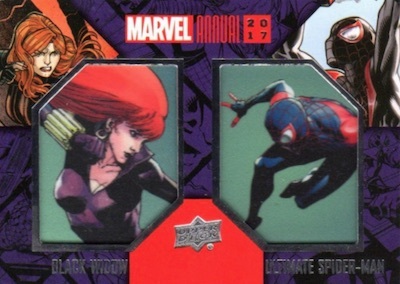 Revisiting the comic book action at Marvel during 2017, the retrospective release promises one premium pull, like a sketch or manufactured patch card, in each hobby box. 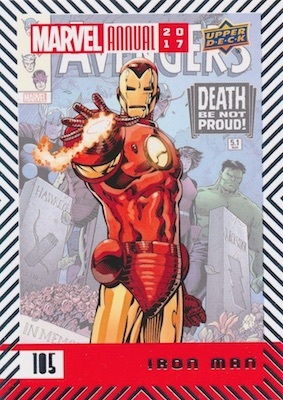 Continuing the format from the 2016 version, plenty of notable events occurred on comic pages, and Marvel Annual 2017 aims to pay tribute. Flipping back to key moments, plot twists and characters, the 100-card base set also features limited parallels including Printing Plates. 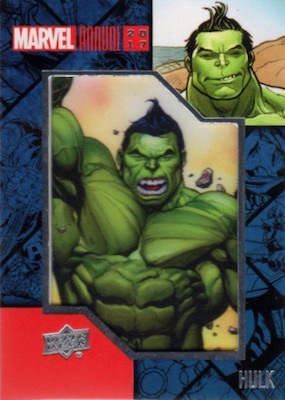 In addition, 2017 Upper Deck Marvel Annual presents a full assortment of inserts. 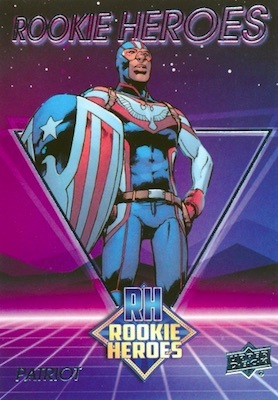 Rookie Heroes highlights the notable debuts, while In Memoriam (Spoiler alert!) bids farewell to those who left the comic world, either by choice or in battle. 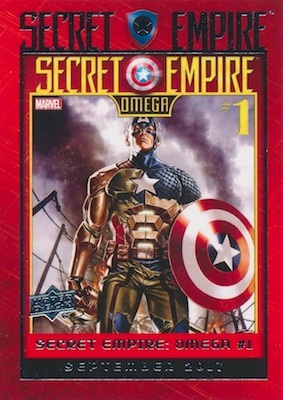 Using the artwork from the fronts, Secret Empire Comic Covers cards provide a look at images that are most likely to make an impression. 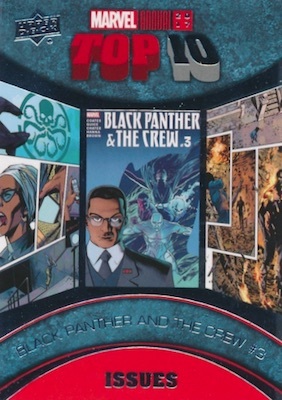 Although this kind of entertainment set doesn't rely on the same exact choices as show- or film-based releases, the 2017 Upper Deck Marvel Annual checklist still works with premium hits that come in every hobby box. 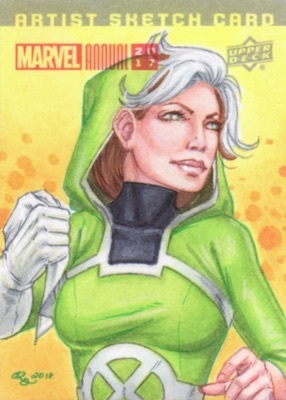 These include hand-drawn Sketch cards, or manufactured Patch and Dual Patch cards. NOVA + HULK 2017 MARVEL ANNUAL SKETCH ARTIST 1 1 LOT! RAMIREZ & CLEOFAS! RARE! 150 cards, including 50 short prints. FOIL PARALLELS (only #10-100): Blue (1:3), Purple (1:20). 23 cards, including 9 short prints. DCP-23 Ironheart and Tony Stark A.I. IT WILL BE CRAP JUST LIKE THE LAST ONE! Total crap. Sketch cards 1 in 6 boxes and the manufactured patchs look like crap. Worst marvel box I have ever opened. 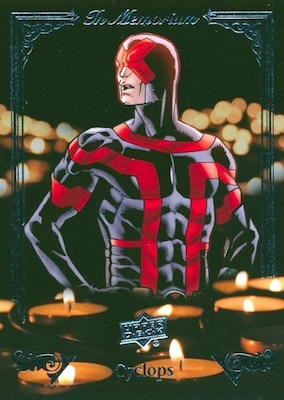 Will be avoiding any upper deck marvel product like the plague.